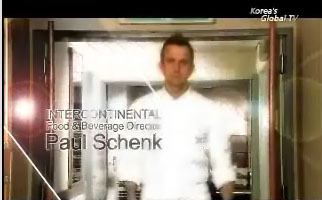 Someone texted me about this show with Chef Paul Schenk of the Intercontinental Hotel(s). It’s on Arirang, which is the international English channel Korea puts out internationally. You likely would see it in your hotel room when traveling Asia. The production values ain’t too bad on this one. I really like it. And Paul’s an energetic host. He’s also really big into Korean food. If you don’t have Arirang or just want to watch it on your computer, you can do it here. I must warn you. Arirang, like many (if not most) Korean web sites, is stuck in the 1990s. You need to use Internet Explorer, sign in to view it, download some ActiveX controls, and the “High” quality video is a streaming Windows Media file that’s just over 300 pixels wide. People say that about the Korean internet. It has high speeds, but the web sites themselves are archaic. It’s like building a large superhighway for horse and buggy traffic. Nonetheless, Korea Confidential is a good show to watch. Do you know if this show is still on the air? I’ve only come across 8 episodes but it’s a great show nonetheless.